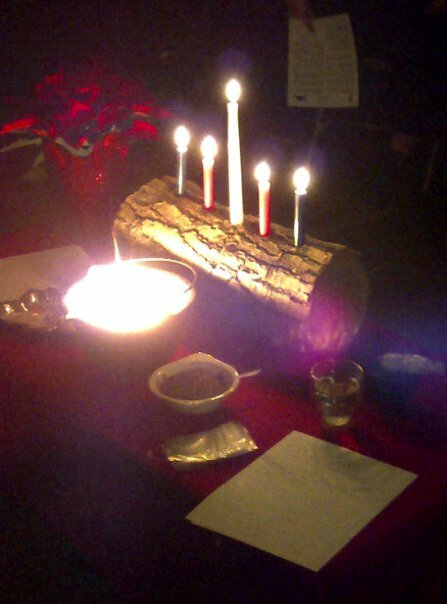 Into a timeless time, unbroken"
I've mentioned before in other December blogs that I celebrate Yule as a Heathen holiday with 12 days of celebration. This year is proving quite challenging and hectic, but since editing the new novel has my blogging limited I thought I'd touch on how yule is going. We began our celebration this year on Sunday the 21, the day of the official solstice, by waking up to a gift exchange. Santa, you see, comes to our house on the solstice (it helps thin out his schedule for his busier night). We woke this year to falling snow*. The kids decided to get up extremely early so the adults were sustained by coffee. And bacon. A good time was had by all, and that afternoon we made gingerbread cookies. Dinner was a feast of ham and orange colored vegetables, some of which were offered to the house spirits. Later we did a small ritual in honor of some of the wights and held a vigil for the returning sun. Monday the 22nd the clouds cleared briefly in the morning and the new sun shone down bright and glorious before the cloud cover closed back in. On that day we honored Frau Sonne with a small ritual and offerings in praise of her return. We lit our Yule log and let the candles burn out. Today, the third day of Yule, we choose to honor the Wilde Jagd (Wild Hunt) which rides this time of year. It is believed that the Hunt rides especially when storm winds blow and tonight my area is getting a Nor'easter - so truly the Wild Hunt is riding tonight here. Offerings will be made tonight that they pass us by unharmed. Tomorrow we will honor our house spirit with an offering of porridge and butter. We also have a family tradition with the children of watching a movie (Polar Express) and having popcorn and hot chocolate and the house spirit will receive a portion of everything. So we celebrate Mutternacht on December 25th by honoring and offering to the "mothers". On December 26th we honor the spirits of the land. We also cleanse and sain our property, first by walking the boundary with fire and then by scattering a small amount of salt. This is also the anniversary of our kindred's founding in 2006 so we usually get together to celebrate Yule as group on this day, although this year due to scheduling we are meeting on the 28th instead. On December 27th we honor our ancestors with offerings and stories. A white candle is lit for them. On December 28th we honor Oski - Wodan as the Wish-giver. Small gifts are exchanged and offerings are made to him, and a small ritual is done. Omens are taken for the year to come. On December 29th we honor Frau Holda as the leader of the Wild Hunt, with Wodan, and as the protector of children's spirits. On December 30th we honor the Hidden Folk, specifically the perchten and huldufolk who travel with Perchta and Frau Holda. On December 31st we honor Berchta. Offerings of fish and porridge are left out. We ask her for her blessing in the coming year, especially for good health, and we thank her fo rall her blessings in the year that is past. This may seem like a lot but it really isn't. It's just a little each day and much of it is really fun, especially because of the children. The 12 days are hectic, but they go by quickly and everyone enjoys them. ** by the Julian calendar the 8th day of January would have shifted back on the Gregorian calendar to roughly December 25th, which is why Bede refers to it as the night they celebrate the birth of Jesus. *** Gentile is often translated here as Heathen or Pagan but the actual word given is gentili so I have preserved the closer meaning. "willfully eccentric orthography in which certain aspects of Old Irish, together with other usages which seem to be the fruits of pure fantasy, are deployed without rhyme or reason to produce a kind of Irish which looks like nothing else on earth". (Carey, 2014, p 8). What this means in practical terms is that the Irish of the CMT is in many ways a puzzle. There are points were it is difficult to be sure what a word is supposed to be and others were it is entirely supposition. The way I approach this is to use context to help suss out the most logical guesses with words that aren't obvious. Keep in mind though that expert linguists don't agree on what some of these words are so my translations should be understood as educated guesses. For this fourth attempt I am tackling Lugh's incitement of the army of the Tuatha De Danann before the battle with the Fomorians. Normally translations of this piece end after saying he circled the army. So that upon his cloak Lugh sang this to intervene, on one foot and one eye, encompassing the men of Ireland. "Fight* a slaughterous battle! There is fierce battle, a contentious, cutting army contending before armies of phantoms, men of the land beware. Aligning to truth without choice, following furies. Bursting forth, overthrowing, dividing, black truth: little white death-ring, Hale! Hale! Woe! Woe! Sinister**! Fierceness! A sanctified omen after cloud-shadows our fame will be spread through armies by triple skilled Druids. I am not reduced by battles at borders: wounding, matched, slender-speared, sky ravaging, deadly brilliance, burning, greatly subduing them, greatly thundering, the sun rises. Asking each nine of them, in the presence of Ogma and also in the presence of sky and earth, in the presence of sun and moon. A band of warriors is my company for you. My army is a great army, ramparts here, fleet-footed, seething, strong-guarding, choosing, may we fight a slaughterous battle! Fight!" There has been a trend in American society that is sending a message - a disturbing message - that some lives are more valuable than others. That some people matter more. I could point to specific cases but really there are so many examples its hard to choose which ones to include and which ones to ignore. And I don't want this to become a debate about the details, the minutia, of one example. Because I'm not talking about just one thing here. I'm talking about all of it. Black men and children killed, choked to death, shot, because of the perceived threat they represented. Woman viciously attacked for not smiling back or giving their number to someone. Gay and trans people killed for openly existing. Over and over the message goes out that some lives matter less than others, some lives are disposable. We as a society must stop this. We must stop perpetuating this idea that color, gender, sexual identity, and yes nationality and language, effect the value of a person. We must each come to a place where we understand that beneath these superficial difference - as beautiful as those differences are in creating the diversity of our world - beneath those differences we are all the same. We all want to be happy, to feel safe, to be successful. We all laugh and cry the same. We are all born and we all die. We all bleed. I was raised on original Star Trek, where you it didn't matter if you were African, Japanese, Russian, Scottish, or even Vulcan - a person's value wasn't about the color of their skin, or where they were from, or what language they spoke. We need more of that in the world today, more understanding that a person's value lies in the person, not the external details. Even the antagonists in Star Trek were nuanced and presented as people. Can we as a modern society really not do as well in reality as a television show from the 1960's at accepting diversity? We all matter, no matter what color, or ethnicity, or nationality, or language, or gender, or sexual identity. Black lives matter. Women's lives matter. LGBT lives matter. Every life matters. No one should die because someone else sees them as a "what" instead of a "who".